A year or so back, I sent a polite email asking for a review copy of a Korean book, and I got a polite reply in return with a PDF attached. Unfortunately, with a marked preference for physical copies, I was never likely to prioritise it, and it soon slipped to the bottom of my TBR pile, languishing forgotten inside my Kindle. However, last month, on one of my occasional trips to the university library, I saw that there were some new acquisitions on the Korean shelves – including the book that had completely slipped my mind. So, here’s a review that’s been a good while in the making. Still, better late than never, eh? 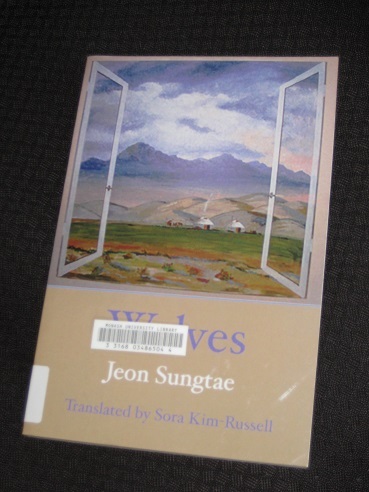 Jeon Sungtae’s Wolves (translated by Sora Kim-Russell) is a book that brings together ten short stories, collected and published by White Pine Press (a publisher with a whole series of Korean fiction and poetry releases). A striking feature of the release, though, is that not all of the stories really seem like they should be together. I’m not criticising the quality here (they’re all excellent pieces), but there’s a distinct difference in both the style and setting of some of the inclusions, which may be a little surprising for an Anglophone reader used to the idea of a thread running through collections. Gary felt at home in that artificial city. Newcomers were strangers to each other. They didn’t know what each other did or how and where they lived. Here, anyone could reinvent him or herself if he or she had a mind to do so. The bulk of Wolves, however, is taken up by six stories set not in Korea, but in Mongolia. Running to around 110 pages between them, you suspect that this could be (and may have been) a book in its own right. These pieces were inspired by a visit Jeon made to Mongolia, and they make up a fascinating insight into the country, doubly filtered through the writer’s nationality and the process of translating the stories into English. Several of them take a look at life in Mongolia through the eyes of foreigners. In ‘Chinese Fireworks’, a Korean pastor is confronted with the struggles of Mongolian street children, learning about their customs and morals in the process. ‘Korean Soldier’, by contrast, has a visiting Korean professor on a sabbatical introduced to the dark side of the country. His first days are marred by noise, pollution, crazy traffic and encounters with some rather ruthless locals. Luckily, when he needs help after locking himself out of his apartment, another side of the people comes to the fore, with a group of unlikely allies cheering him on. Mongolia used to be a communist country, and this means that North Koreans feature in several of the stories. ‘The Magnolia’ describes a meal at an outlet of the famous North Korean restaurant, where not all is as it seems, and we make a return visit in ‘Southern Plants’. This time around, one of the waitresses, about to return home, makes an unexpected request of a South Korean man who is himself stranded in Mongolia. Both these stories show the uneasy relationship between southerners and northerners in a neutral place, with most of the Koreans carefully balancing feelings of brotherhood and suspicion. While all of these are excellent stories, the writing has a different dynamic when we leave the capital. ‘Second Waltz’ has a Korean writer accompanying a group of poets on an overnight train journey to a reading in a distant city. When he gets there (and once he manages to escape the grips of an over-eager policeman), he goes on a hunt for a legendary North Korean woman who became a nomad. As he and the beautiful woman accompanying him get further away from civilisation, it becomes a wild sheep chase of the best kind in the Mongolian wilderness. During that time, the land changed. A road was paved across the steppes and fences enclosed the earth where the horses and sheep should have run. The camp grew by scores of ger,and a Western-style hotel appeared less than a dozen miles away. I climb the hill from time to time to look down at the asphalt road that cuts across the land. That black tongue looks like capital itself. That’s what money is. It brings in things you could never imagine. Capitalism and progress bring changes for better and worse, and as the story progresses, there’s a sense that everyone is hunting for something different. It all makes for a wonderful tale with a dramatic, and unexpected, ending. Sounds fascinating: that said, I don’t have any Korean lit on the bookshelves. Only Korean-American! I really like the idea of the shoes stories and ‘Imitayshun’. But, no a PDF version wouldn’t have worked for me, either, so am glad you found the book.